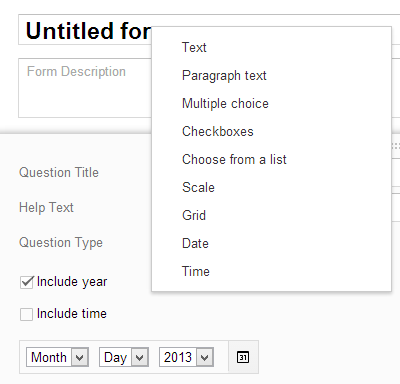 Google Forms added two new question types for dates and time. 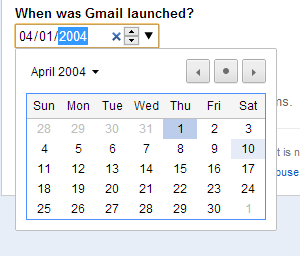 There's a pretty useful date picker, but you can also enter dates manually. You can customize the time questions and enable "duration" to ask questions like "how much time a day do you spend on Facebook every day?". To add a question to your form, click the arrow next to the "Add item" button and select "date" or "time" from the list of question types. If you're wondering what's next for Google Forms, the source code reveals that Google will add support for rich-text editing, embedding images and that Google Forms will integrate with Fusion Tables and Google Scripts (codename "maestro").